Launched by Universities Australia Executive Women on Tuesday 20th November 2018. 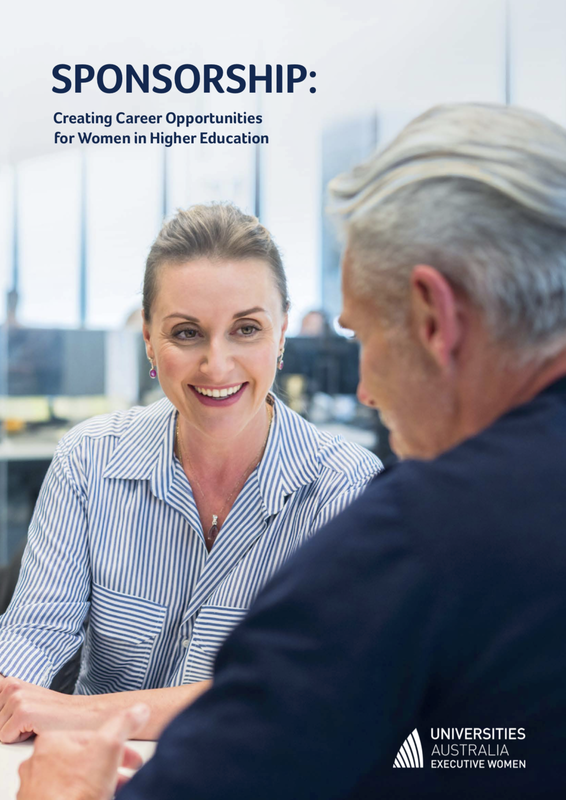 This publication is an educational and strategic tool to guide universities, and individuals working within universities, to address gender diversity and equality issues that may arise through currently informal sponsorship practices. We position sponsorship not as a formal ‘program’ to be implemented, as you may do with mentoring, but part of effective leadership development and practice. Commissioned research examining the position of academic women within the Faculty of Engineering, Computing and Maths. Extensive qualitative and quantitative data, and includes a strong focus on Faculty Leadership, including interviews with 12 male leaders (Dean, Deputy Deans and Heads of School). Comprehensive list of recommendations. Designed to provide a critical review of mentoring literature and practice, and as a resource specific to HE practitioners. Equally suited to those outside Higher Education and particularly useful where culture change is also desired. This paper builds on the Mentoring Program for Senior Women paper (Bell, 2009) and subsequent program in order to suggest a complementary next step for UAEW to pursue. UAEW, in conjunction with the LH Martin Institute, is well placed to take on a leadership role to build sector capacity in best practice delivery of women only mentoring programs. Transformative Gender Interventions: Linking theory and practice using the "bifocal approach". Translating the well-established theory of the gendered organization into strategic interventions that build more gender equitable organizations has proven to be difficult. The authors introduce the emergence of the “bifocal approach” and its subsequent development and examine the potential of the “bifocal approach” as a feminist intervention strategy and an alternative means of countering gender inequalities in organizations. The authors show how the bifocal is able to overcome some of the main difficulties of earlier transformative approaches..The bifocal approach seeks structural change, however, the change effort rests with individuals. The purpose of this paper is to examine male and female executives as leaders “championing” gender change interventions. It problematizes current exhortations for male leaders to lead gender change, much as they might lead any other business-driven change agenda. It argues that organizational gender scholarship is critical to understanding the gendered nature of championing. This paper is of value to practitioners and scholars. It draws attention to contemporary issues of leadership and gender change, seeking to bridge the gap between theory and practice that undermines our change efforts. Exploring Nordic feminist organisational theory and practice through the lens of the ‘bifocal approach’: Contributions to the theory and practice of transformative gender interventions. This paper follows on closely from my previous paper (The Bifocal Approach’: (Re)positioning Women’s Programs published in Strid, Husuand Gunnarsson 2012) where I shared my enthusiasm at discovering a wealth of Nordic scholarship vitally concerned with the research and practice of transformative gender interventions in organisations. Poster presented at Gender Summit GS7, Berlin 2015. Mentoring programs are commonly used to help individual women advance in their careers. We report on a successful mentoring program that uses innovative design to address organisational change, as well as individual development. The program has been operating in the Faculty of Medicine, Dentistry and Health Sciences (MDHS), The University of Melbourne, Australia since 2011, and is currently in its fifth year of implementation. The Faculty has 2200 employees, with 70% academic and 30% administrative staff. Women are under-represented in senior faculty, with women only totalling to 28% of all professors. Sponsorship is increasingly recognized as separate to, and distinct from mentoring. In many respects it has eclipsed mentoring, with claims that it is a key ingredient in building careers and often a ‘missing ingredient’ for women. Despite this popular embracing of there is a research gap regarding sponsorship practices within higher education and research institutions. We report on a successful staff mentoring program within the Faculty of Medicine, Dentistry and Health Sciences (MDHS) at the University of Melbourne, Australia. The program commenced in 2011, and is currently in its fifth year of implementation. The aim of the mentoring program is two fold: to create an organisational culture and environment where MDHS staff feel valued and nurtured, while at the same time, enabling individual staff to reach their full potential. This report is an evaluation of a program designed and facilitated by Jen de Vries. The Program formed part of the Faculty’s Equal Opportunity for Women initiatives. The aims of the Program were to contribute to a culture and environment in which women staff in the Faculty feel valued and supported to “navigate, survive, and thrive” in their work environment, and reach their full potential. The Program was intended to help maximise the participation of women staff in senior leadership roles in the Faculty by increasing individual staff members’ ability to meet their career goals. An additional objective for the Faculty was the building of a body of mentoring experience and expertise amongst all staff in the Faculty. This article was not written by Jen de Vries. The Faculty of Medicine, Dentistry and Health Sciences implemented a mentoring program using Jen de Vries as their consultant. The program targeted Level B academic staff and Level 8 professional staff and on Jen's advice adopted both one to one mentoring and peer mentoring as complementary strategies. The Evaluation report of the pilot program strongly endorses the bifocal approach and the design and facilitation of the program. This chapter results from a keynote address delivered in Switzerland to the European Mentoring Network (eument-net) in 2010. It draws on Jen's doctoral research and the mentoring component of Leadership Development for Women at the University of Western Australia. It explores the capacity of mentoring programs to contribute to gender change and outlines a mentoring continuum as a way of understanding mentoring relationships. There is considerable literature about the impact of mentoring on the mentees but little is known about the effect of the mentoring relationship on the mentor. This paper aims to address that gap. The paper assists academics and practitioners to conceive of mentoring as a core element in an effective organisational change intervention. The innovation is to move mentoring away from assuming a deficit model of the mentee. As this programme shows, a focus on what needs to change in the dominant organisational culture, practices and values can lead to key players in the organisation becoming actively involved in the needed change process. The Ally Network aims to create a more diverse and inclusive culture at UWA by promoting greater visibility and awareness of gay, lesbian, bisexual, transgender and intersex (GLBTI) staff and students and their issues. Central to this project is the training and development of a network of 'Allies', that is, staff and students who are prepared to align themselves with and advocate on behalf of GLBTI staff and students. This paper explores the climate for GLBT people in the workplace and describes two projects that aim to make The University of Western Australia community safer and a more productive and positive work and study experience for GLBT people.